Many millennials are filled with dread when it comes to managing finances. New Delhi: Varun Kotak, 22, started working at an outsourcing solutions startup in Bengaluru in June. When it comes to work he knows it all, but what fills him with panic is his poor knowledge and ability to handle his own finances. “I have no clue about how the taxation process works. I don’t even know if my income is taxable," said Kotak. He has started investing in a systematic investment plan, but doesn’t know if that would give him any tax benefits. Kotak is not alone. For thousands of millennials like him who have joined the salaried ranks for the first time, the new year brings with it a new worry—taxes. They saw their fathers stressing about their taxes and now they have the sinking feeling that they are in the net too. Here is a cheat sheet for those filing their first income tax returns this year. It is good to think about a strategy rather than a let’s-get-this-over-with approach. This “eeeew taxes" approach keeps the home fires burning for insurance agents, who feed off ignorance and panic as February approaches and companies send emails to employees asking them to submit investment proofs as declared. Why does one have to invest to save money? Here’s why. The Indian tax system taxes income under five heads, one of these being “salary income". “The income taxable under the head “salary" would include salary, allowances, perquisites, profit in lieu of salary and deductions," said Naveen Wadhwa, deputy general manager, Taxmann.com. “‘Salary’ includes 14 components but the most popular ones are basic salary, dearness allowance, bonus, leave salary encashment and gratuity." Taxpayers have to put all the taxable items together and get a number. From this total you are allowed to reduce certain amounts to calculate the “gross total income". For example, you will subtract a “standard deduction" of up to ₹ 40,000. This was introduced in last year’s Union budget in lieu of previous exemptions for medical bills and travel allowance. Standard deduction is a fixed deduction that can be availed by all salaried individuals without submitting any documents or bills. You will exclude the house rent allowance according to a formula. Now comes the investment-to-save-taxes part. The government allows you to save taxes if you make investments in certain products. You are allowed to invest (or spend) up to ₹ 1.5 lakh a year in what are called Section 80C investments (right, you got it, they are written under Section 80C of the Income Tax Act). This ₹ 1.5 lakh is deducted from your gross total income, bringing down the amount of income on which tax will be paid. Suppose your taxable income works out to be ₹ 10 lakh, post investment under Section 80C your taxable income is ₹ 8.5 lakh. This reduces the amount of tax you will have to pay. “Based on this, you can arrive at the amount of investment you must make in order to save taxes. There are various tools available online for individuals to derive this estimation," said Mrin Agarwal, financial educator and founder director of Finsafe India Pvt. Ltd and co-founder of Womantra. The next step is to find out which tax bracket you fall under. For those with a taxable income of up to ₹ 2.5 lakh, the income tax is zero. A taxable income above ₹ 2.5 lakh but below ₹ 5 lakh attracts tax at the rate of 5%. On an income between ₹ 5 lakh and ₹ 10 lakh, the tax rate is 20%, while an income of above ₹ 10 lakh attracts a tax rate of 30%. In addition, there is a cess of 4% for all income brackets. If your income exceeds ₹ 50 lakh, you need to pay a surcharge of 12% and 15% if your income is above ₹ 1 crore. There is a basket of items from which you can choose to make this ₹ 1.5 lakh an investment or expenditure. This includes Employees’ Provident Fund, Public Provident Fund, life insurance premiums, Equity-linked Savings Scheme, special five-year bank fixed deposits, National Savings Certificate, principal of a home loan, school fees of two children, stamp duty and registration fee paid on buying a house and so on. Remember to not rush to buy life insurance policies because they are being sold the most aggressively. “Tax planning needs to be a part of financial planning and the instruments chosen must be based on your goal," Agarwal said. “Generally, I find that tax planning is done first and then investors decide how to use these funds as and when the requirement comes up, which is not right." There are other reasons for you to take this seriously and not lock yourself into investments if you have short-term goals. “For instance, if you require seed capital for entrepreneurship in a few years or plan to study further, you should know that tax planning instruments typically have a minimum three-year lock-in period. In which case, investing for tax saving may not be an option," said Vishal Dhawan, founder, Plan Ahead Wealth Advisors. Unit-linked insurance plans, for example, are designed for long-term horizons and locking yourself into such an investment may not be a good option as your goals and needs might change along the way. Also, don’t let hard sales talk dull your mind. 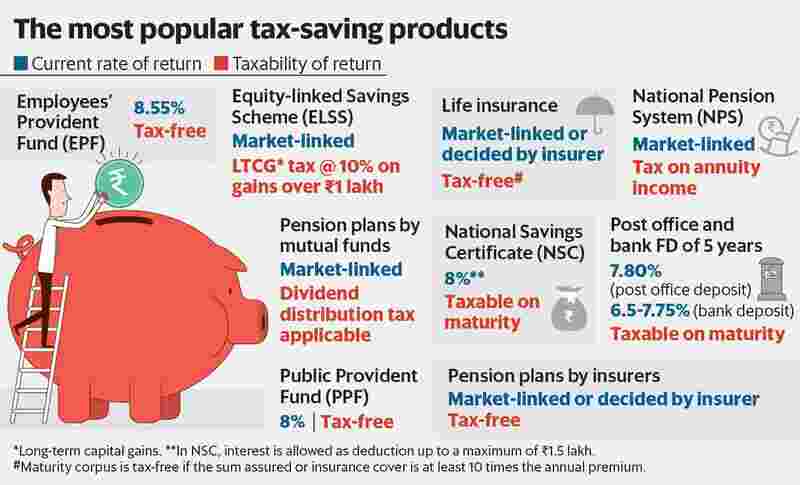 Wadhwa says that taxpayers generally ignore important factors such as return on investment and liquidity and consider only the quantum of tax savings. “One should distinguish between the end goal and ancillary benefits of an investment." Step back, see what works for your money today and for the next 30-40 years. That’s how long you will be doing this exercise.